Internationally known movie animal trainer Bonnie Judd will be offering a limited number of Dog training for film and movie work classes. 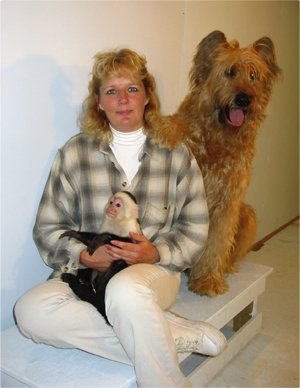 In a career spanning over 20 years Bonnie has provided and trained animals for hundreds of movies, television shows and commercials. Her credits include such animal-centric features as Air Bud II, III, IV, Cats and Dogs, Good Boy! such series as Corner Gas, Caprica, Supernatural, X-Files and the number one Superbowl Commercial "Fergus Bud Light". As an Animal Coordinator for the Film industry Bonnie's job is to cast dogs ad other animals for a variety of film, television and commercial projects with the odd still shoot thrown in. She decided to develop a set of dog training courses to build a pool of trained dogs she call upon for film projects. Whether you think your dog has star potential or you just want your dog to have strong basic obedience skills– these classes will fit the bill. Bonnie is looking for new animal talent to fill out her roster. Purebreds and mixed breeds welcome! Bonnie has found that dogs that have both a strong grounding in basic obedience as well as specific movie skills such as working with upseats and marks make the best candidates for film and television work. During class Bonnie will have an opportunity to help you develop your dog’s star potential. To excel at movie work dogs should have good temperaments and sound conformation. Dogs completing the training will automatically be added to the Canine Costar’s animal talent roster and have the opportunity to be put up for movie work. For a class list please visit our upcoming classes page. Video interview with Bonnie on Training dogs for the movie Industry and she demonstrates a few techniques to try at home.